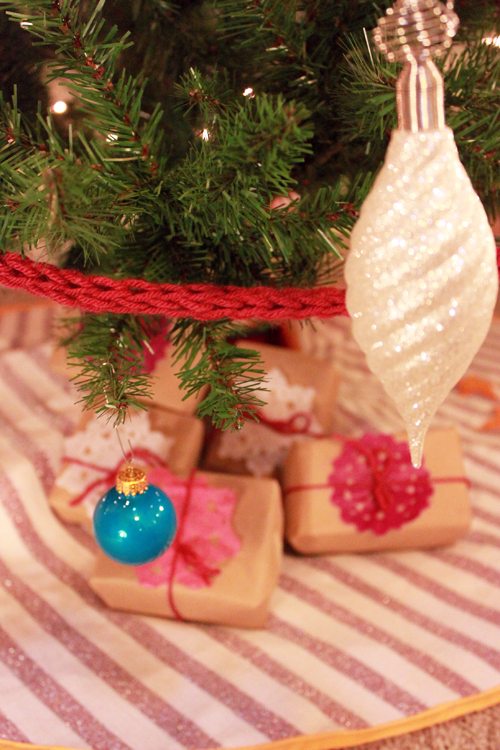 If you've got the DIY bug you'll appreciate this post on making your own tree skirt. It's a keeper no matter how you customize it. Thanks, Stacie! Hello! 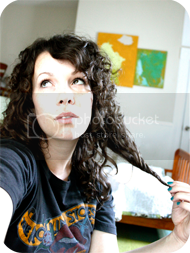 It is Stacie from GingiberSnap! 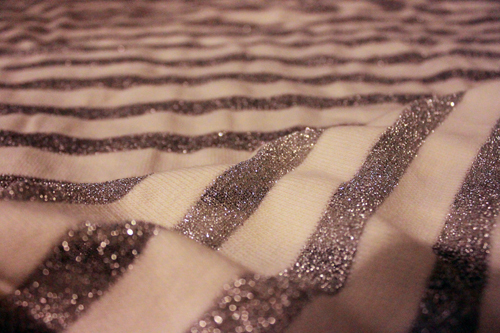 Recently, I mistakenly purchased some non refundable striped knit fabric, complete with silver tinsel woven into the yardage (tip: always read the entire item description for online purchases, because I never would have bought silver shiny fabric if i had known)! 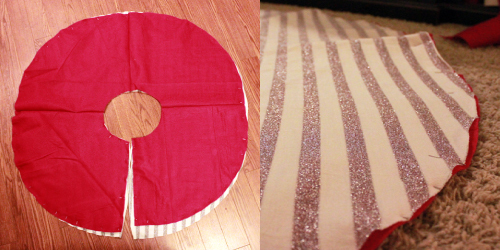 My solution: Make an awesome silvery striped tree skirt to go under my Christmas Tree! 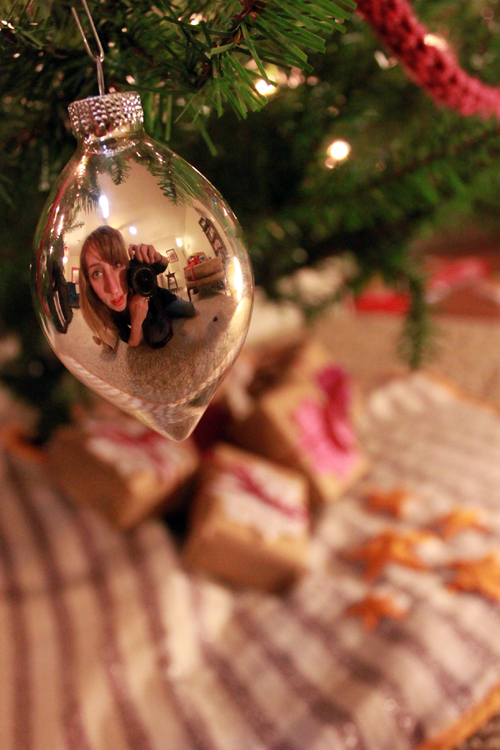 I am totally into silver metallic this Holiday Season! 1. 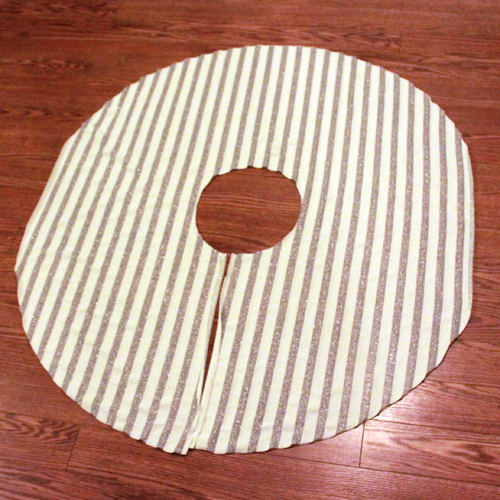 Trace a large circle onto the knit fabric (I created a perfect circle by folding my fabric into quarters, tying a piece of string to the low part of a pen, holding the string down where the center of the circle would be, and drawing around the center while keeping the string tight. Unfold the fabric, and instant circle! 2. 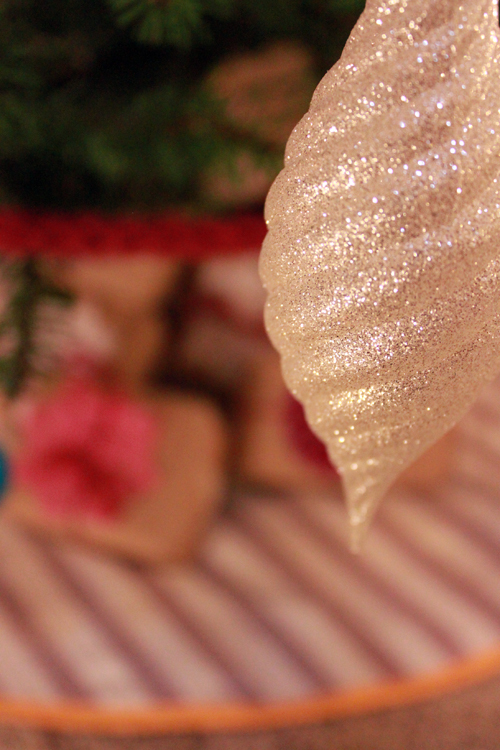 Cut out a small circle from the center of the larger circle using the same method (this will go around your tree base. Then cut a straight line from the small circle to the outer circle. 3. To give the fabric some structure, use the first fabric skirt circle to trace and cut out another skirt from a sturdy fabric. 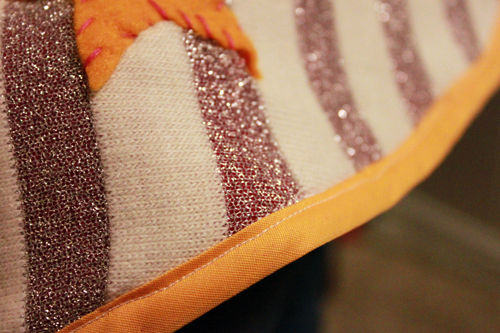 I used some awesome pink felt from the remnants section of my local fabric store. 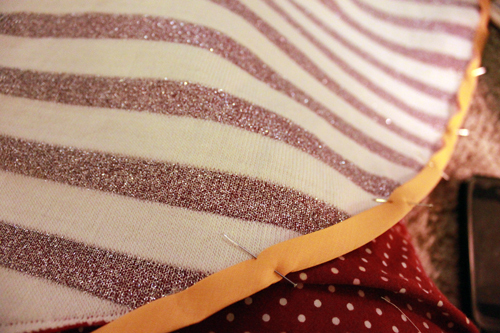 Then pin both fabrics together. 4. 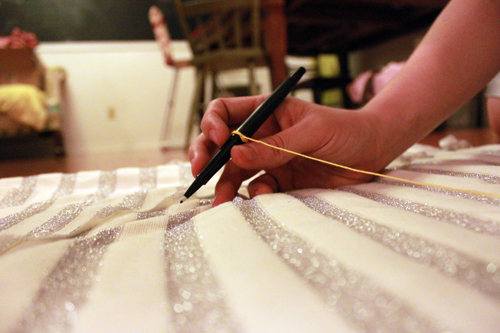 Grab some pretty bias tape, and go around the pentameter of the skirt, until all edges are covered. Then run it through your sewing machine. 5. 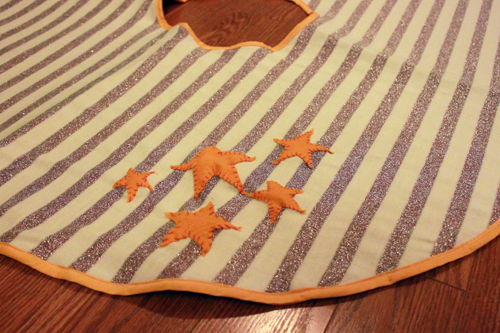 Finally, I decided to applique some simple little felt stars to the front of the skirt. Voila! 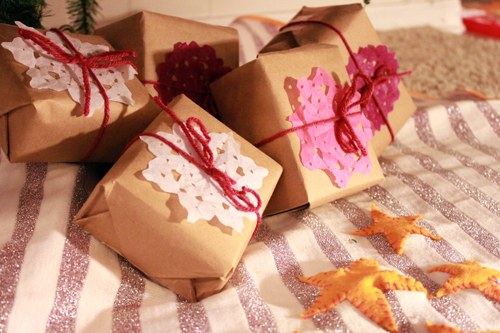 Wrap some pretty packages with brown craft paper and paper snowflakes! This definitely adds some much needed pop to my tree! 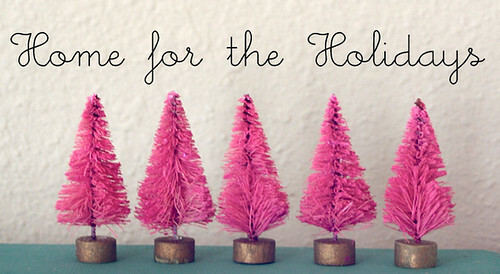 I hope that this inspires you to make your own version of a Christmas Tree Skirt this season! Stacie is one of my favorite new artists with a similar aesthetic to home decor and DIY crafts. Her work has recently been popping up on OhDeedoh, Kenziepoo, Decor8 and many more and I'm happy to have her screenprinted stockings hanging in my living room! 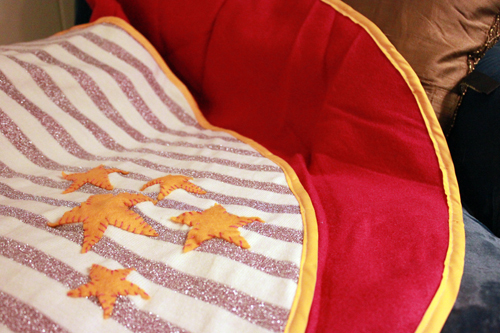 She's got a charming little girl and is chasing down her dreams one project at a time. Thanks, Stacie! oh yeah! 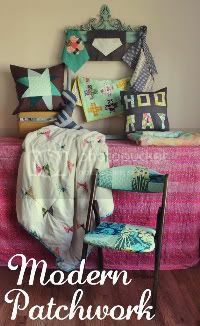 totally going to make one this weekend! yay. i also love the present-wrapping job! Nice nice! Holy moly. Just came across your blog, I am in love. So much inspiration. You are awesome! This is beautiful and so inspiring! 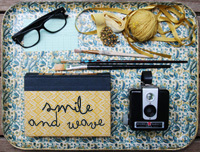 I follow Stacie's blog and I'm always in love with what she comes up with. I love it! It's a good thing you mistakingly bought the silvery striped fabric, because it's perfect for underneath the Christmas tree! Oh, this is lovely!! :) So cute! The yellow is just the best pop of color!! I love the skirt and the red garland! Any idea how she made the garland? It looks crocheted, and pretty simple. It's perfect for a Christmas tree! I love this idea! We were thinking we need to get a tree skirt but maybe I'll try and make one! love this post, so adorable! !